Yes - we have a soul - but it’s made of lots of tiny robots. Someone else said that … not me … yet I very much like it. Basically, this quote refers to the idea that for the majority of the time we are basically all running on auto-pilot; we are driven by the programming that was installed in each of us by the culture we were born into, by what our parents taught us, etc. It is very difficult, if not impossible for most, to break from this programming and actually ‘think’ for ourselves. Hence. most people’s stubborn willingness to hold to an ideology that has been thrust upon them from the day of their birth. This of course, opens the way for an interesting discussion on the concept of ‘free-will’ - if such a thing actually exists. 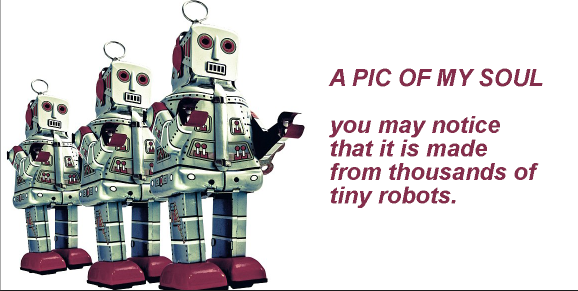 I do have soul … but it is just constructed of many thousands of tiny robots.